Nicotine is a drug that is highly addictive and should honestly be avoided. People who smoke know just how hard it can be to quit. All cigarettes contain nicotine, which is one of the most addictive legal drugs available. In fact, some people claim it can be just as hard to quit as more serious drugs like heroin. 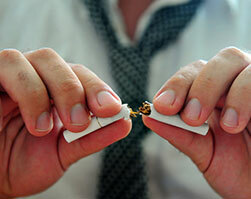 In many cases, people make several attempts to quit smoking before they are truly successful. Sometimes it simply takes a few tries and learning some things about your own personal struggle with smoking before you can quit 100%. Anyone can quit with some effort and extra help. You’ll live a longer, healthier life and will have a better overall quality of life. Your chances of getting cancer or having a heart attack or stroke will greatly decrease. For pregnant women, quitting ensures they will deliver a healthy child. Everyone around you including pets and family members will be healthier as a result of you quitting. Some smokers experience a better sense of taste and smell after quitting. You’ll have more money to spend on other things. There are five major steps everyone should take to begin down the path towards quitting smoking for good. 1. Prepare yourself mentally and know you’re about to quit. Set a date that you plan to quit. Stay away from smoking areas or others who smoke as much as you can. Get rid of ashtrays and lighters from your home, desk, and car. Do not let others smoke in your home. 2. Ask for help and support from others. Tell the people in your life who care about you that you’re quitting. Ask them for moral support. If they smoke, ask them to be considerate and not smoke around you. Have a conversation with your doctor and let them know you want to quit. If you’re having a hard time, you can go to therapy or counseling. They can help you get through the difficult withdrawals and other problems that can come with quitting. Many health centers offer help for nicotine and drug addiction. 3. Learn new ways to cope without smoking. Take a walk, make a phone call, or do something to keep you busy rather than smoke when you get the urge. Change your daily routine for a while. Take a new route to work, drink something different at breakfast and lunch. Go to a different grocery store. Use breathing, meditation, or other things to de-stress. Read a book or get some exercise when you feel stress come on. Make a plan ahead of time to do something you want each day. 4. Get nicotine replacement or other medication, and use it following the directions closely. There are several different medications approved by the FDA to help people quit smoking. Some of these include nicotine gum and patches, nicotine inhalers and sprays, and prescription medications. Make sure you follow all packaging or prescription directions carefully when taking this medication. This medication is designed to help you quit, and then make sure you’ve quit smoking permanently. If you’re pregnant or under the age of 18, check with your doctor first. You should also check if you smoke less than 10 cigarettes a day or have any medical conditions. 5. Understand that no one is perfect and that you may relapse. Also, be prepared for difficulties in life and do not use smoking as a tool to get you through them. Try not to drink alcohol when you’re quitting. Drinking can make it much more difficult to quit. Try to avoid being around other people who smoke. Temptation to smoke will make it much harder for you to quit. Some people gain around ten pounds or less when they quit. Do not be discouraged and try to eat healthy and get plenty of exercise. Gaining a few pounds is safer for your health than smoking. If you get stressed or are in a bad mood, try not to use smoking as a tool to cope. Even perfectly healthy people should quit smoking, but some people may have an even more important or pressing reason to quit. Pregnant women or new mothers: You will not only protect your unborn or young child by quitting, but you will ensure that you’re going to be around to take care of your child throughout their life if you quit smoking. Patients recovering from surgery: Healing is prolonged in people who smoke. If you quit, you will be able to recover from surgery or heal an injury much faster and more efficiently. People who have had a heart attack: If you’ve had a heart attack in the past, quitting will help reduce the chances of having another one greatly. Cancer patients: Quitting smoking can help reduce the chance of a tumor growing or reoccurring, especially for patients of lung, head, or neck cancers. Parents: You are helping prevent your children from getting illnesses due to second-hand smoke. You’re also setting a good example by not smoking around or in front of your kids. Before you quit smoking, it’s important to ask yourself some very essential questions. Write the answers down, and have a discussion with your doctor or therapist if you need some feedback. 1. What are the main reasons you’ve decided to quit smoking? Who will benefit, and why? 2. If you’ve tried to quit previously, which tactics worked? Which ones did not? 3. What are some stressful situations that will make quitting difficult? What are some ways you can handle them without smoking? 4. Who will be your support group when you try to quit? Think of close friends, family members, and your doctor. 5. What makes smoking enjoyable for you? What can you do instead to find happiness and pleasure without smoking? 1. What can you do to make sure I am a successful quitter? 2. Which medications do you recommend that will help me quit smoking? 3. Are there other suggestions or resources you recommend in case I need more support or help? 4. What will I go through when coping with nicotine withdrawal? What are some suggestions on dealing with it?